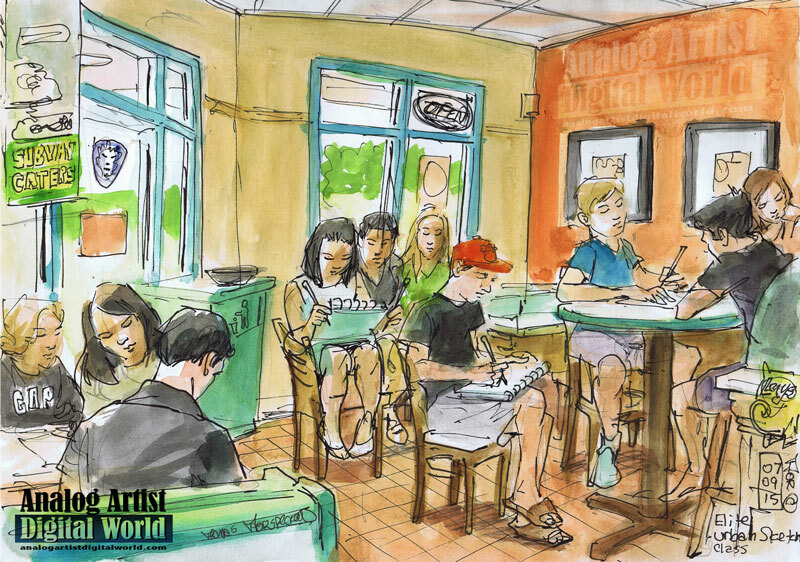 I am now teaching Urban Sketching Course at Elite Animation Academy (8933 Conroy Windermere Rd, Orlando, FL) to middle school and high school students.This is a wonderful opportunity for me to share my love of simple direct observation and the pleasure that can be found from always carrying a sketch pad. The small class size, allows me to always offer notes for every student's sketch. The first hour of each class, we work in the classroom on warm up exercises and the day's lesson. Then we break out of the classroom and sketch on location somewhere in the neighborhood. On this occasion, we sketched in a Subway's Sandwich shop. The lesson on this sketch outing was one point perspective and the students looked down the length of the shop. It is always rewarding to watch students get lost in the process. The re is always some socializing as well, and I has he to find the right balance between work and play. If only a few students develop the habit of documenting their lives in sketches, then I have certain done my job. Live painting demo in the Rose Garden. Weekend Top 6 Picks for April 30th and May 1st. The Winter Park Paint Out takes over Park Avenue. Weekend Top 6 Picks for April 23rd and 24th. The Piano Man of Washington Square Park. Rise up October closed down streets in NYC. Weekend Top 6 Picks for April 16th and 17th. The Jungle Book opens April 15th. In the Black, A Tax Day Burlesque. July 4th Drip Pool Party. Wine and Art in Downtown Lake Mary. Weekend Top 6 Picks for April 9th and 10th. Drip Local Art Night featured Public Record. Alone is to premiere at UCF Celebrates the Arts. Red Bull One North American Final. Overlooking the Göreme Open Air Museum. Weekend Top 6 Picks for April 2nd and 3rd.